Please copy and paste ' [[Category:Snakeheads]] ' into the end of your article to include it in this category. Snakeheads belong to the family of Channidae. Found throughout Africa and Asia, they are predominantly freshwater, although some species are also found in brackish water. As their name suggests, they have a long snake like head, large mouth, sharp teeth and an elongated dorsal fin. 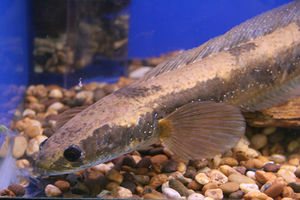 In parts of Asia and Africa, the Snakehead is considered an important source of food. It is important to note that the keeping of any Snakehead as a pet in the Australia and some parts of the US is illegal! This law came about after some species of Snakehead escaped (or were released) into the wild, decimating local wildlife. Although only a few species would survive through all seasons in these non-native countries, a blanket ban was put on Snakeheads. This page was last edited on 1 September 2015, at 14:49.